The KTM 1190R would be without a doubt the twin-cylinder adventure bike with the greatest off-road ability. It is aimed at those riders who take the word ‘adventure’ even more literally. When the 1190R came to the market in 2013 it was a big step for KTM. On paper, it was the model designed to take the BMW GS’s crown. Looking at the spec sheet for the 1190R the bike sits at the bigger end of the adventure bike spectrum, tipping the scales at 217kg plus fuel, with 220mm of suspension travel and 890mm seat height. It’s nearly as heavy as the BMW 1200GS, and with 148hp it makes for a lot of motorcycle. Since it’s launch the bike hasn’t changed a great deal. The unbelievably good 1290 Super Adventure and the tamer 1050 Adventure were launched to cover bases in the adventure bike market, which are well suited to the tarmac. Everything about the 1190R points toward the dirt. 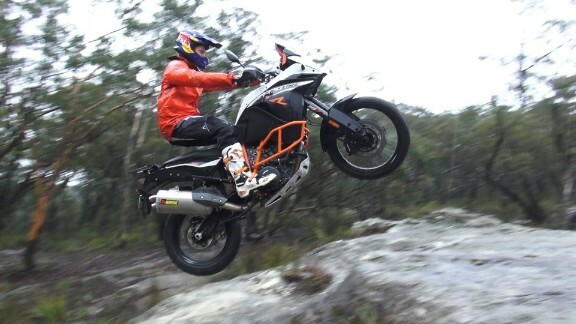 It is clear KTM is trying to build the ultimate big bike for dirt riding adventure seekers. Here’s a little confirmation of the 1190R’s off-road capability, being ridden like an EXC by Red Bull enduro rider Chris Birch. The tubular space frame is made from chrome-molybdenum stainless steel. It’s extremely stable and weighs only 9.8kg. The consistent lightweight construction contributes to the low overall weight of 217 kg, and 235 kg fully tanked. The tubes are laser-cut for perfect clearances, and robot-welded to the highest standards. More than adequate braking is ensured due to the finest quality Brembo components. 320mm front discs with four-piston calipers, and at the rear 267mm disc with two-piston calipers. It is all controlled by the MSC with Bosch 9ME C-ABS. The 1190R comes with 21″ and 18″ wheels which are well suited to offroad riding. Continental Trail Attack II tires are fitted as standard in 90/90 ZR (260) 21 front, and 150/70 ZR (260) 18 to the rear. The wire-spoked wheels for tubeless tires feature airtight rim beds which are patented by KTM. The rims combine the easy fitting benefits of a tubeless tire with the robustness and stability of a wire-spoked wheel. With so much power available, the front wheel can feel very light and can lead to a kickback on rough roads. The 1190R prevents this with a WP steering damper. One component of the comprehensive Bosch MSC assistance package is the lean-sensitive cornering ABS. It is the safest and most efficient deceleration system on the market. When the front brake is actuated, the rear brake is always applied in parallel to optimize the ride stability when braking. It can be switched off, and also placed in Offroad Mode. Offroad Mode allows the rider to block the rear wheel when required, a must for off-road riding when executing deliberate slides. The ABS remains active on the front wheel even in Offroad Mode. As part of the MSC package, MTC also regulates subject to the lean of the bike. 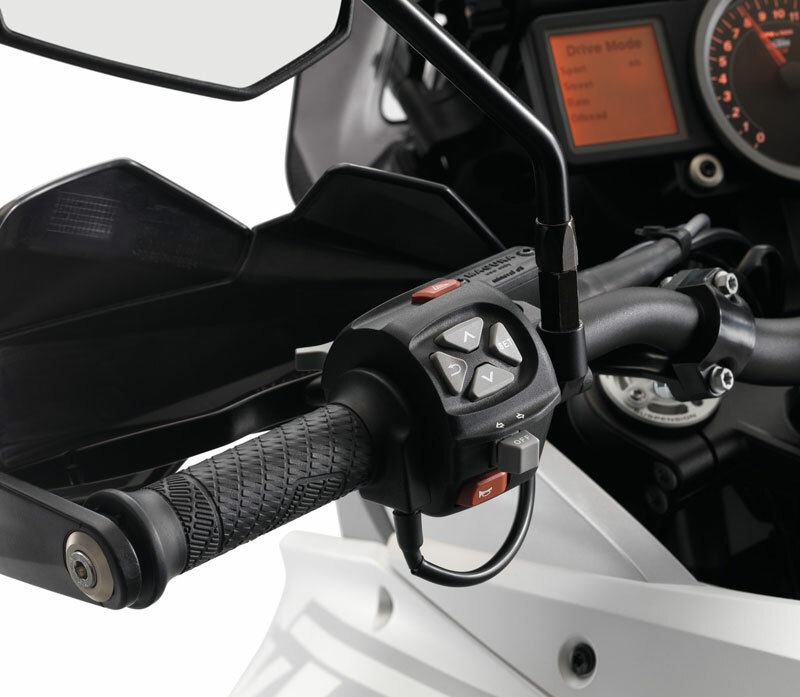 For different levels of rear-wheel slip, the MTC system provides four different modes, selected in connection with the engine modes using the multifunctional switch on the left handlebar grip. Depending on the MTC mode, the EMS (Engine Management System) also adjusts to a suitable power level. Rain: Minimum slippage in the wet with engine power reduced to 100 hp max. Off: No electronic assistance for those that want maximum power at all times. Sport mode has the most aggressive power delivery and the least TC intervention. Street mode provides a bit more of a safety net. In Rain mode, rear wheel slip is virtually eliminated. Monitors tire pressure which shows in the display with a warning in the event of pressure loss. The Ride-By-Wire system ensures perfect application of the power. It electronically translates the rider’s throttle commands into the throttle valve positions to suit the riding conditions. The twin ignition system controls two different sized spark plugs in each cylinder head independently of each other to optimize the combustion sequence at all times. This leads to better-controlled power, lower fuel consumption and fewer emissions. 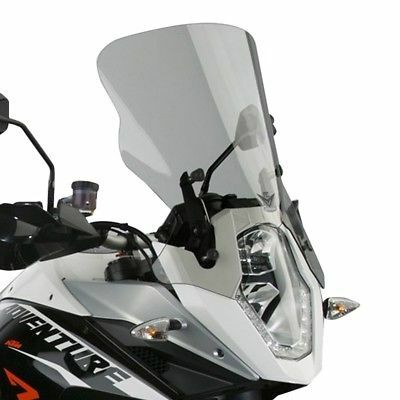 The state-of-the-art instrument features a central LCD for displaying riding conditions plus speedo and rev counter, and another LCD to the left to display the adjustable features. Riders will find the multifunction cockpit well laid out, with menus that are easy to browse and set. The electronics are simple to navigate, but it would be nice to be able to turn off the MTC on the fly, in the same way that the ride modes can be changed. 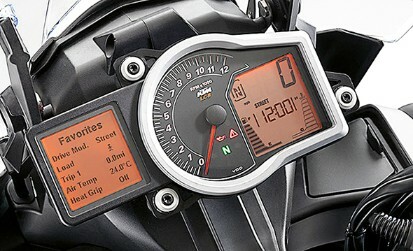 Different modes can be selected with the mode switch on the left-hand side of the handlebar. It’s a simple ‘up’ and ‘down’ through the menu selection with the left button, and confirm with the right button. The 1190R is comfortable for long stints in the saddle, although the seat could be a little softer, while the handlebars and footpegs offer a small range of adjustment. The high seat height may be a challenge for riders under six feet tall, but that’s the tradeoff for the extra suspension travel. The ergonomics can be adjusted to suit riders of different heights and for different riding locations offroad or asphalt. The height can be adjusted to suit different rider heights by 25mm with an easily operated clamping mechanism. Wind protection provided by the screen is excellent, with buffet-free airflow. The KTM 1190R is a bike that is built for riders who have a good level of off-road skills and want to ride in places that others don’t. If you’re looking for your first adventure bike to try some off-road riding, then this isn’t the bike. It’s not bad on the road but at no point is it great. What it lacks on the tarmac is only highlighted because of models like the BMW 1200GS or the 1290 Super Enduro which perform so well on the tarmac. Does it work as an adventure bike? Absolutely! If you’re looking to ride in as much difficult terrain as possible, then this bike would have to be at the top of your list. Attach some soft panniers to carry a few extras and you’re set for some overnight adventures. 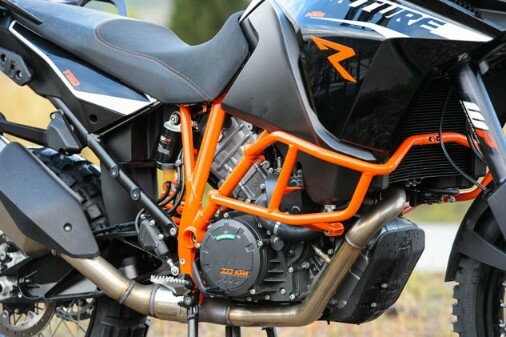 As usual, KTM’s Power Parts accessory division has a large range of bolt-on products to improve functionality, protect and personalize the 1190 Adventure R.
Adam Riemann is famous for his MOTONOMAD trilogy of full-length feature films. MOTONOMAD 1 covered his travels from Austria to Egypt on two KTM500EXCs. 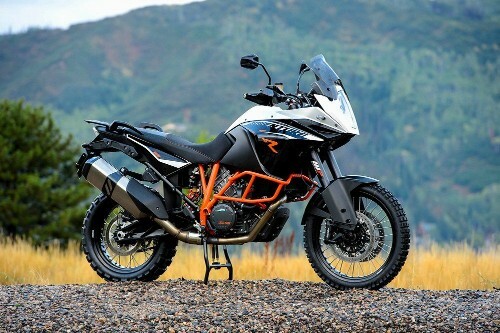 Have you owned one of the KTM series of adventure bikes? What are your thoughts on the 1190R? Please feel free to share your experience with readers in the comments below. 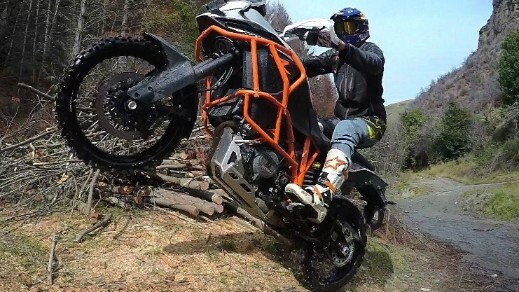 Great review on the KTM Adventure but I’m wondering if it is suitable for someone just getting into the off road style of biking? My son is now 23 and he has an interest in this model, along with a couple of other similar models, but he’s not what you’d call an experienced rider in off-road skills. Would this be a good choice for him to start with? If not, what bike would you suggest/recommend? Hi Chris. This bike would be more suited to experienced riders off-road. A smaller bike would be more suitable to learn his off-road riding skills on. I did a review recently on the Suzuki DR-Z 400E which would be easier to handle. If you show him this review, see what he thinks. My post: Tips for a beginner Dirt Bike Rider may also help. Thanks for your comments. Let me know if I can be of any more assistance. Great post ans wow what a bike. I’m not such a fanatic in it like I used to be, I’ve always imagined myself riding these kinds of bikes, but somewhere I changed. But my wife is a fanatic and she loves to drive with it, and when I will show her this bike she will be like: Buy it for me please. So I will show her, you will see her reaction. Hi Emmanuel, you’re a lucky man if your wife is keen to ride with you. I have never had a partner who shared my love of motorcycles. It would be fantastic to go adventure riding with your wife. Maybe you should rekindle your interest, there are some fantastic bikes around now, and there are lots of husband and wife riders, you could have a ball. Thanks for your comments.